Ares Bringer of War is the seventh book in a series about the Greek gods by George O'Connor. It follows the gods as they watch the events of the Trojan war. I have to admit, the book started off a little slow. There was way too much narration, which I am not a fan of. The narrator started off explaining the difference between Ares and Athena, both Greek gods of war. Then he talked about what it's like when a soldier is possessed by Ares in the heat of battle. One thing I did like about this beginning is the depiction of the ancient Greek battles, and Ares fighting in the middle of it all. It started to pick up for me once the prologue was finished. There was a lot less explaining who Ares was and a lot more showing what was happening to Ares. I like that. My favorite scene in the book is when Athena blesses King Argo with divine strength. 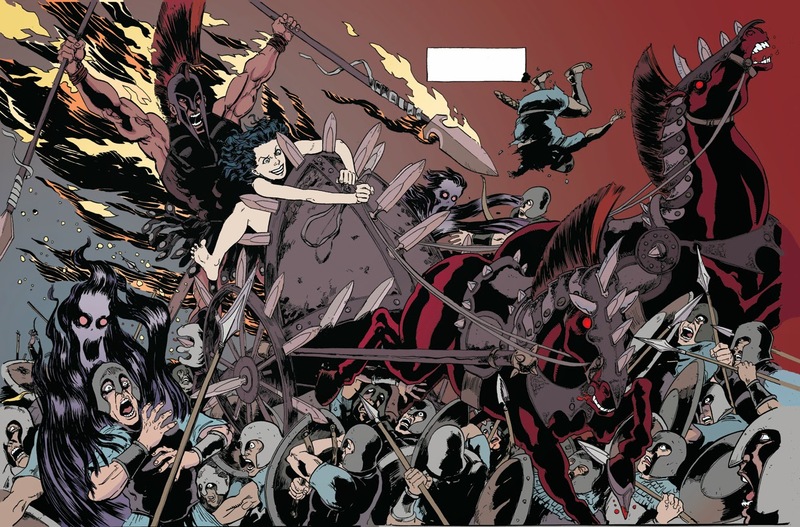 During King Argo's godly rampage, Aphrodite reaches down from the heavens to save one of her demigod children from King Argo's wrath, but he stabs her through the arm and continues with his bloody work. I like this scene because it is the first time in the series that we learn that the gods can be wounded by mortals. It makes them more relatable. The art in this is one of my favorite things about the book. The characters are beautiful and the landscapes are epic in proportion. The noses of the characters are very specifically drawn. I have never seen noses drawn the way they are in this book. They look like upside down shields. I personally think that Ares Bringer of War is pretty PG. The violence is not very bloody, there are no sexual innuendos, and the language is clean as a whistle. 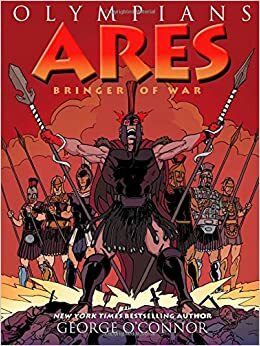 I would definitely recommend that you read Ares Bringer of War if you happen to find it in your local bookstore. 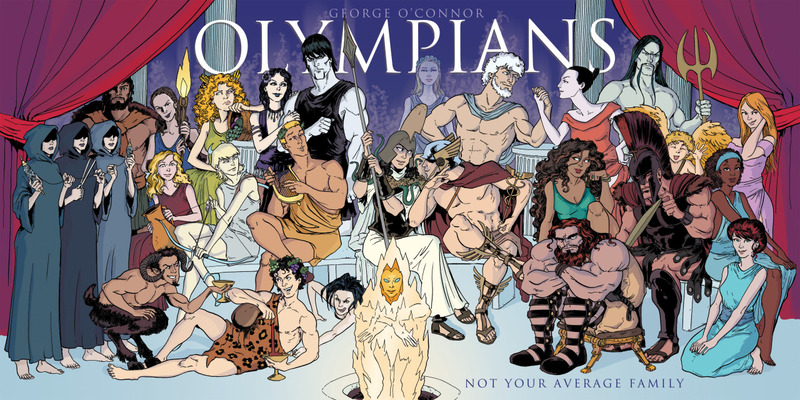 If you find the other Olympians books, you should get them as well I would give Ares Bringer of War 6 vicious hoplites out of ten. This review was part of the Ares Bringer of War Blog Tour. If you want to see other reviews, click on this link. 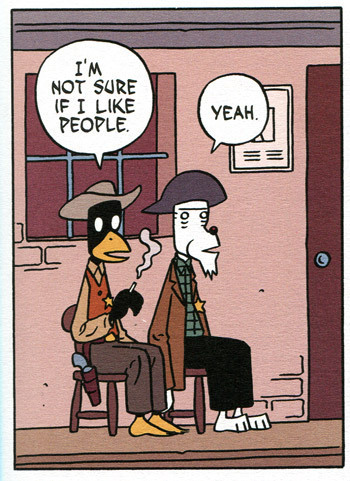 Today I'm going to be reviewing one of my favorite series ever, Dungeon by JoannSfar and LewisTrondheim. This dungeon is not actually a prison as one might think. It’s more like a big obstacle course which adventurers flock to with dreams of wealth and glory. There are piles and piles of treasure which entice the poor fools to try to brave the dangers that lie within the dungeon walls. They come to steal some of the treasure, but instead get massacred by the monsters of the dungeon. Their weapons and jewelry are added to the treasury. 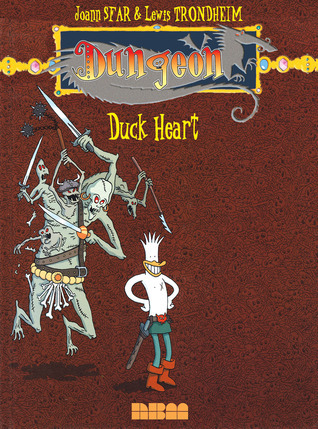 The dungeon is run by the Dungeon Keeper, a short white bird with a top hat and a pipe that releases smoke in a skull shape, reflecting his mood. 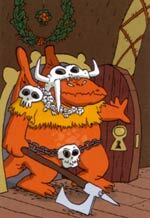 He started the dungeon when he was young. His most trusted employes include Marvin, a man sized, very religious dragon who serves as the Dungeon Keeper’s body guard, Herbert, a light hearted duck who has a long descent into evil, and Alcibiades and Horus, the two alchemists of the dungeon. Over the course of over a dozen books, the dungeon becomes a major political power, and therefore gains all the problems brought by its position. It’s attacked constantly and the system becomes more and more corrupt. They create their own secret police, participate in underhanded dealings, and accept bribes from neighbors who fear invasion. Dungeon is set during three major time periods in the dungeon’s universe. 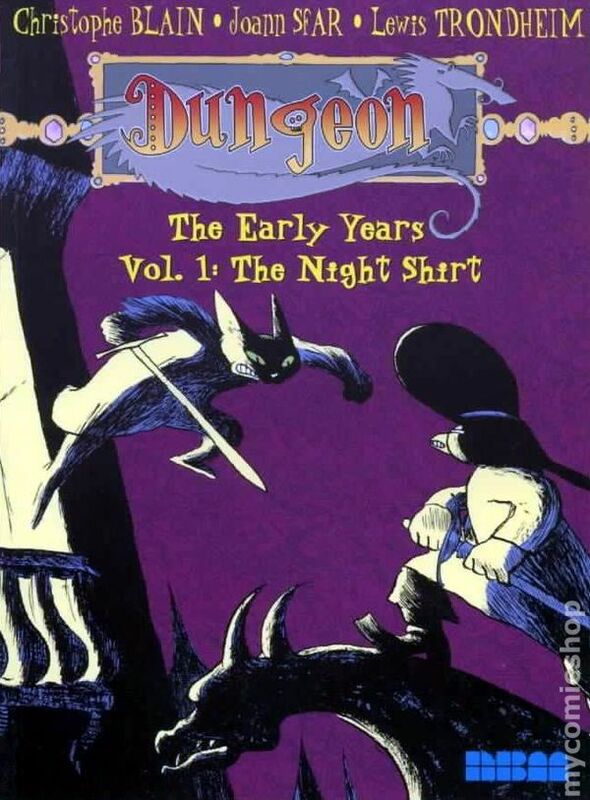 The Early Years follows its rise, Zenith takes place during the height of the dungeon's power, and Twilight is the story of the dungeon’s downfall into madness. Each one of these time periods has several books devoted to them. Even if you only get the books in one time period, you will have a very full experience. Each is like it’s own little series. The art in this book is unforgettable. 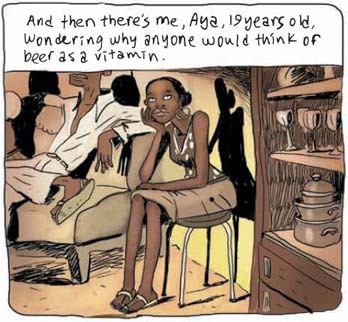 It looks very French, which makes sense considering that Joann Sfar is French (Joann Sfar is not the only illustrator, other artists draw short stories for the bonus books). There are a lot of very broad, flat colors in Dungeon. One of my favorite characters, Marvin the Red, a skinny little rabbit who thinks he’s a brave warrior, who was exiled from his rabbit town because he was born with red fur, is a shade of red that never changes. All of the characters are designed to pop off the page. The world of dungeon look goofily cartoony, but It makes sense considering that all of the characters are anthropomorphized animals, monsters and magical creatures. You will never find anything even remotely similar to Dungeon. It is its own thing which makes it all the more amazing. I warn you younger readers, there are some quite bloody and sexual scenes. The violence is never scary. Characters get their heads lopped off all the time, but it’s humorous because these awful acts are being carried out by these almost cute little animals. While detailed, the art isn’t very realistic which makes the gore completely un-terrifying. 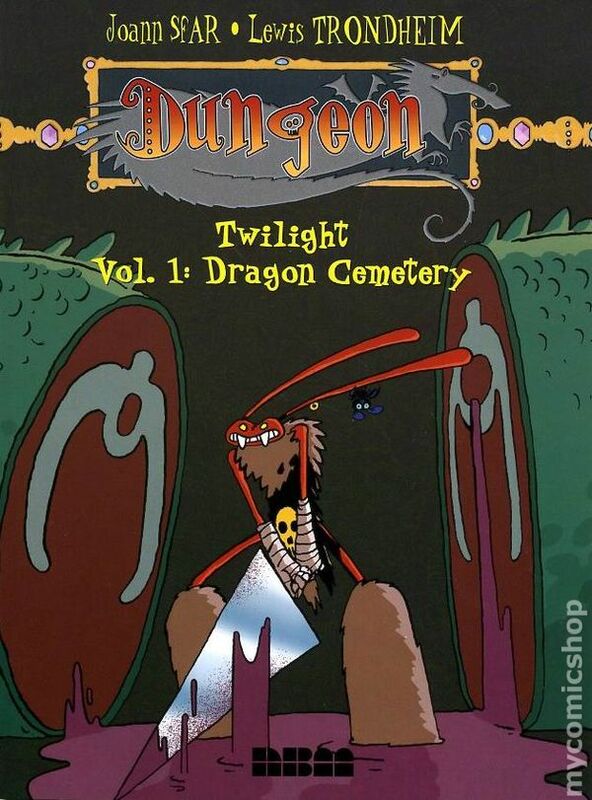 With the holidays almost here, I think the complete set of Dungeon is a perfect gift for anyone 14 to 65. I'm sure you'll all get hooked. I find myself rereading these books at least once every two months. I would give Dungeon 10 vicious red rabbits 10.